Disney Tangled: The Video Game is a story-based adventure sent in a vast kingdom featuring characters with unique abilities, colorful environments, creative play, fun quests, and competitive racing challenges. Join other players to collect as many items as possible and win! 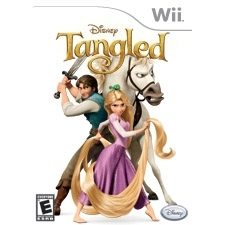 FEATURES: Maneuver through an action-packed world with in-game VO from the film's talent, Mandy Moore and Zach Levi; Swing into action as Rapunzel using her golden tresses to pull objects and grow flowers in "charm mode"; Destroy objects, climb walls, engage in swordplay and discover hidden treasures as Flynn; Collect a variety of colors to draw and paint the Tower wall; Engage in fun activities and multiple mini games; Discover coop with 2-4 players.